Ingredients: Sodium Bicarbonate, Cream of Tartar (Tartaric acid), Sodium Laureth Sulfate, Lauryl Betaine, Perfume, *Limonene, Cocamide DEA, Grapefruit Oil (Citrus grandis), Bergamot Oil (Citrus bergamia), Frankincense Oil (Boswelia carterii), *Linalool, Hydroxycitronellol, Gardenia Extract (Gardenia jasminoides), D&C Green No. 8, D&C Blue No.1, Lustre Holly Sparkle (Potassium Silicate, Titanium Dioxide, FD&C Yellow No.5, FD&C Blue No.1), Red Peppercorns (Piper Nigrum). Review: This is a lovely, light green scent. Ths lovely bubble bar has the same scent as Lush’s new “Go Green” solid perfume scent. It’s not as dark green and earthy as Tramp for instance. Nor is it a green floral such as Lush’s Flower Tub scent. 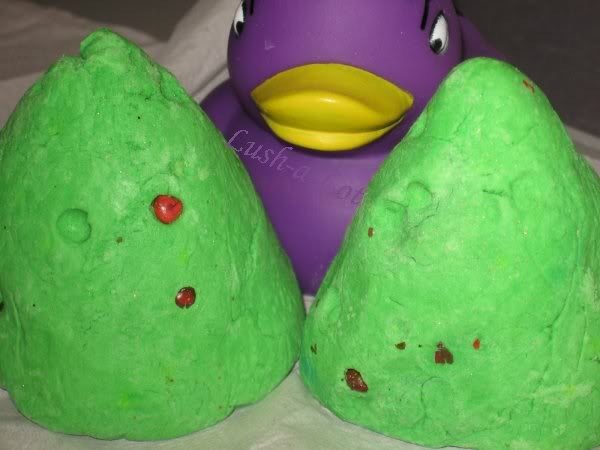 It is , however, somewhat similar to “Green Day” bubble bar’s scent. There’s a light green mildly citrus and mildly sweet Frankincense. Green Green Bath Of Foam is more of a fresh, clean, tad citrussy scent with a smidgeon of frankincense holding it all together. It’s not too strong at all to me. Nor do I think this would be too anything to anyone. It’s just right. 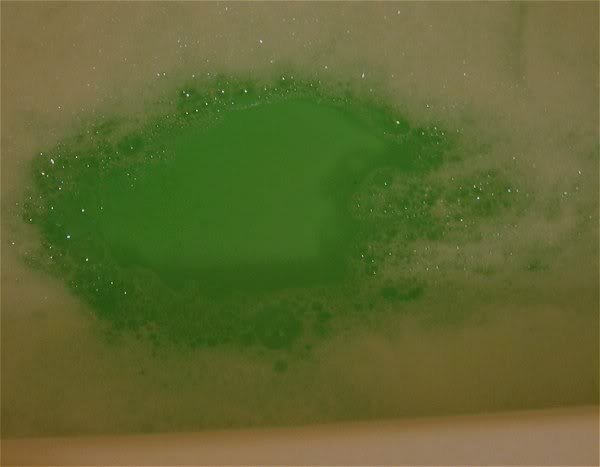 Green Green Bath Of Foam bubble bar makes a lovely Emerald coloured bath water. I love the Christmas Tree shape of the bar and the brightly green color with the little red peppercorns in it is festive looking for the Christmas holiday. Very pretty. 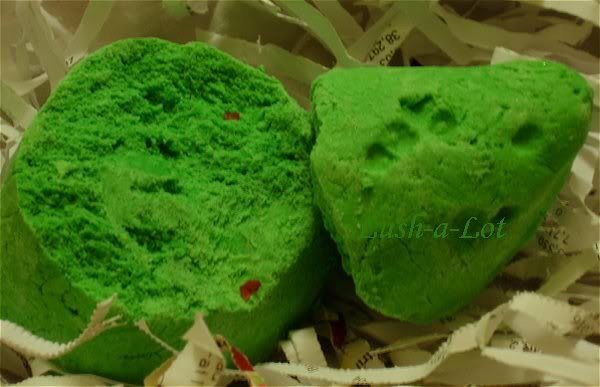 I also think I’m old enough to remember the song “Green Green Grass of Home” so I love and appreciate the the witty name Lush they gave this Green Green Bath of Foam bubble bar. I give this bubble bar a 5 rating. Lush Times Description: Introducing our new Go Green fragrance. New, fresh and reviving! Green Green Bath of Foam is scented with Go Green, a blend of smoky vetivert, sparkly grapefruit, uplifting neroli and invigorating cedar leaf. We make it look like a tiny fir tree decorated with peppercorns. They do nicely as yuletide decorations and you can use them up in January. Posted on November 25, 2016 by Lushalot	• This entry was posted in Uncategorized and tagged 5 rating. Bookmark the permalink.